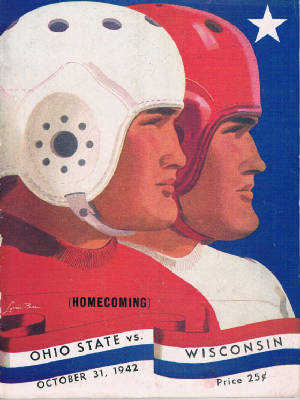 for the first time since 1912, they MUST beat the vaunted Buckeyes. but his hero was a contemporary—local high school star Harry Stuhldreher. and gives you the cold shoulder, well, that could be disillusioning. she didn’t want me to hurt anyone,” he recalled. nerve to greet their tardy coach with a “Take Five!” order to run laps. itself land forces were locked in mortal combat. forces broke through the American south flank during the night of Oct.
or most—of which they never had seen play? Caveat emptor. and Bryer’s story was reprinted in the Wisconsin State Journal. always wanted our players tough. Now we want them tougher than ever. not only for the games to come, but for their future in the armed services. to the armed forces?' We don’t lose them. We contribute them. than he could in football. The sort of war we’re fighting nowadays puts a burden on stamina. standpoint of preparing a youngster for the field of battle of life. big battle he may be in within the next year. make a good football player also goes to make a good soldier. Friday pep rally, Saturday game and dance—on Halloween weekend. hurrah for the men on campus, players and non-players alike. night at the Maple Bluff Country Club. The “fun” was just getting started. with water and eggs. The cops responded by spraying tear gas into the crowd. broke some of the windows. fighting dysentery and racing their roommates to the toilets. also increased the players’ intensity that day. Halloween showdown for the Big Ten lead. remarks got widespread play after the fact. school also sat together in one section. and then a shopping street. laughed. “It’s amazing what fear can do,” he said. gave the Badgers a 7–0 lead with 13:36 left in the first half. 10–0. That’s the way it stood at the half. “flattened” it. The crowd laughed and cheered. he told the crowd and the international radio audience that included U.S.
the radio earlier in the week had picked Ohio State to win. favorites weren’t going to fold. the last Ohio State threat, and bedlam broke loose at the final gun. 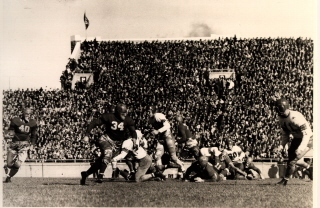 halfback, who watched from the sideline. playing one less conference game than the Buckeyes. Otto Hirsch was one of the many fathers in the raucous locker room. 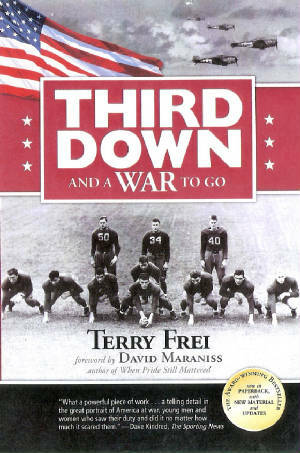 Schreiner paraded with the game ball, lifted out of the pile at the final gun. He almost sounded as if he meant it. 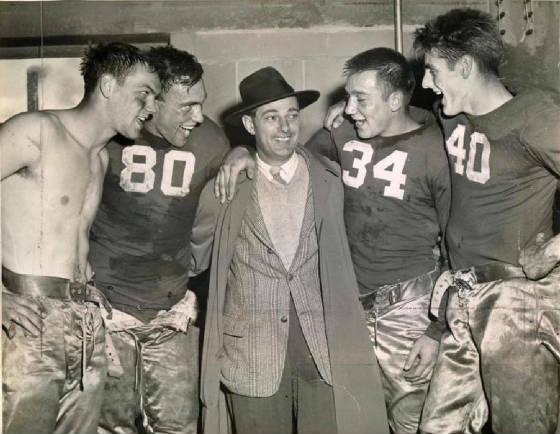 The Badgers’ stars celebrate the team’s victory over Ohio State with their coach. teams were on the field together, Wisconsin was better. some of the players passing by. his fiancée, Arlene Bahr, and Nancy to hook up with friends. atmosphere might add to the trouble. “We went uptown and partied at the Park Hotel,” recalled Tom Butler. World War II heroes, and not all of them returned alive.